Stockwell Skatepark is a 1970s outdoor concrete skatepark with a long history. 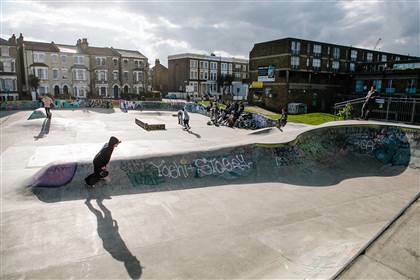 It now has updated modern features such as grind rails, coping and trick box, as well as classic 70s bowls and banks, also known in its time as Stockwell Sands or the Brixton Beach. This is a classic, central London, urban hangout with ever-changing graffiti and tags - overlooked by council estate blocks and typical Brixton grand housing and mansion blocks. [TAGS: Lambeth; skate park/skate parks; skatepark/skateparks; graffiti; urban] If you would like to use this location for filming, please call us on the number below or email us at info@lambethfilmoffice.co.uk to check availability.